Surprisingly filmic and textured, Fox’s weekly version of the 1973 horror classic just might make some viewers’ heads turn, too. It’s anything but a cheap-looking knockoff of The Exorcist and its indelible theme music. 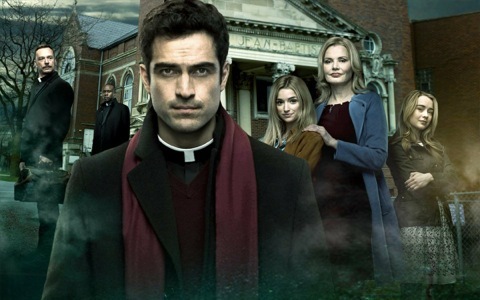 And the magnetic leading man, Alfonso Herrera, is going to go places whether or not The Exorcist becomes a Friday night staple like Fox’s The X-Files or quickly vanishes along with other short-lived feature film knockoffs ranging from Fox’s Minority Report to two versions of Uncle Buck, on CBS and then ABC. Herrera is Chicago-based Catholic priest Father Tomas, pastor of a smallish St. Anthony congregation. He’s been having very bad dreams of late, all of them with visions of a demonically possessed Mexico City boy who’s at the mercy of both the devil and an older priest who’s desperately trying to pull him out of it. It turns out to be Father Marcus (Ben Daniels), who throwing every fiber of his being into somehow salvaging the kid. Meanwhile, the Rance family has become quite a mess. Henry (Alan Ruck) has quietly gone nuts, it seems, while his wife, Angela (Geena Davis), is convinced that a demon is now trying to lay claim to her older recluse daughter, Katherine (Brianne Howley). Younger sis Casey (Hannah Kasulka) is caught in the middle while trying to curb whatever’s ailing Katherine. Or perhaps not. Davis has matured into a character actress after breaking into the biz 31 years ago as the ingenue star of NBC’s short-lived sitcom Sara (with a cast that also included Alfre Woodard, Bill Maher and Bronson Pinchot). Her Angela Rance is effectively desperate, with Herrera’s Father Tomas finally agreeing to make a house call and see what’s up. A trip upstairs to the attic, from where some strange sounds are coming, serves to make a believer of him. And then that theme song kicks in -- and very effectively so while one of the daughters smiles not so benignly upon him from an upstairs window. Fox has made only the premiere episode available for review. It’s suitably chilling and includes some convincing special effects that look as though they’ve got some real money behind them. Whether The Exorcist can keep delivering on its promise is worth finding out. Friday’s curtain-raiser makes a better than expected first impression while at the same time putting Herrera’s hunky, soulful and appealing lead priest in play. He’ll be just fine whether this latest feature film reprise continues to effectively rattle chains or ends up falling apart in future weeks.